What an honor to be chosen to represent DSU in the homecoming court of 2018! 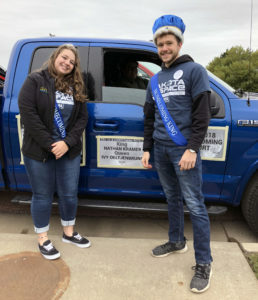 I, along with 9 other DSU students, was truly treated like royalty on Mon, Sept 24, as DSU’s Student Activities Board hosted the coronation ceremony that named DSU’s 2018 homecoming king and queen: Nathan Kramer and Ivy Oeltjenbruns. Tatum Ronke, Kayla Mentele, Jacia Christiansen, Brian Vertullo, Reno Longe, Caleb Dykstra, and Gabriel Simao were the other candidates. As soon as the court was selected, we each received an email with the names of the rest of the court. We quickly began coordinating what to wear. This was a more difficult task than I anticipated, and after much debate, we finally decided upon dark bottom, light top. Of course, this wasn’t specific enough, as we girls wanted to wear a dress or skirt. Should it be light or dark? We ended up with both. Additionally, one of the king candidates had a very limited formal wardrobe available to him on campus, so he threw on all the formal-ish attire in his closet, regardless of color. On a grayscale, he fit the theme quite well! Too bad only 8% of people are colorblind. Somehow, though, he still rocked it! The festivities began with a formal dinner for us candidates, which we were encouraged to invite our parents and families to. Only several parents attended the dinner, but the conference room filled up with family, friends, and students once the ceremony began. After short introductions of each candidate, we all lined up in seats on the stage and secretly anticipated that the crown be placed on our head. Nathan Kramer and Ivy Oeltjenbruns received that honor. Friends and family were eager to snap photos with the royalty and the court, then coronation wrapped up with many of the attendees heading to Daniel Martin’s magic show beginning shortly thereafter. 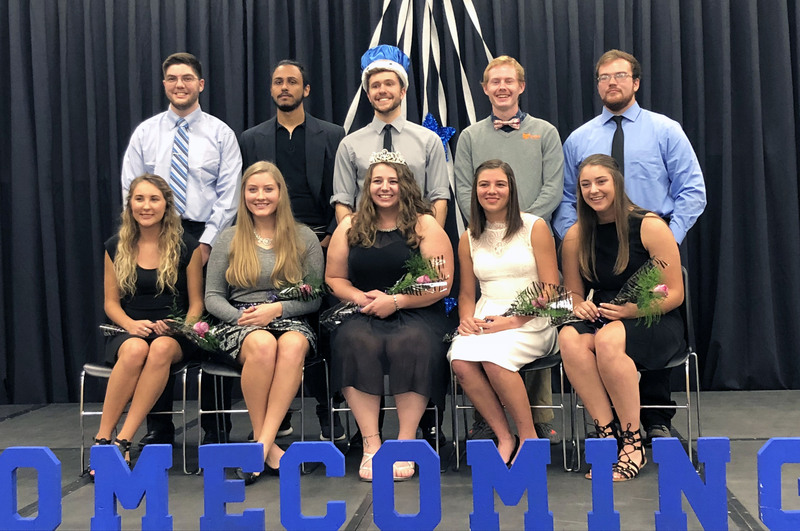 Being a part of the homecoming court was a pleasure and an honor for all candidates involved, not just those that took the crowns home at the end of the day. On behalf of each candidate, I thank all the students who voted and participated in homecoming events, and a special thanks to the Student Activities Board, the DSU faculty and staff, and the city of Madison for all the work and effort put forth to make Dakota Space: Infinite Possibilities a fun and memorable homecoming experience.